Reviews of the leading email marketing services that let you easily send e-newsletters to your customers. Email marketing is a method of marketing to your customers or subscribers through regularly sent emails. Email marketing helps to enhance the relationship between businesses and their clients by relaying specials, sales, tips, tools, or advice via an email list. Since more than half of Internet users check and send email every day, email marketing is a viable marketing tool that is cost effective and easy to implement. Email marketing software enables businesses or marketers create and send email marketing campaigns easily, effectively, and without much training. With online email marketing software, you are typically given a design interface that will walk you through the email campaign creation process. Most companies offer a simple editor that will allow you to see what your email will look like to your readers as you are designing it. Also, email marketing software includes easy-to-use contact management systems that keep all of your contacts in one location. With the addition of advanced reporting options, email marketing software makes sending your eNewsletter as simple as a couple clicks of your mouse. Learn more about the key features of email marketing software. 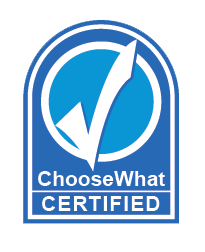 Based on our email marketing research, we created the ChooseWhat Market Standard, to which we compare features, pricing and options of all the email marketing software we review. Below is a good list of standards you should look for when choosing your email marketing provider. Why Buy Email Marketing Software? Email marketing is one of the most cost-effective forms of marketing out there. Why should you use email marketing software to get your email newsletter to your customers? It’s inexpensive. Email marketing is very economical compared to almost any other form of advertising. The price range we encountered was from a fraction of a cent to a maximum of three cents per email. It’s targeted. Email marketing software allows you to target specific groups of potential customers with every campaign you send. It’s fast. Campaigns can be developed and sent in minutes with email marketing software, guaranteeing that your materials are relevant and timely when received. It’s effective. Email marketing software allows you to reach out to your prospective customers through their inboxes, rather than waiting for them to visit your website or receive a direct marketing piece. It’s trackable. Email marketing software enables your email campaign to be tracked and analyzed from the moment someone opens it to the second they close it. It’s automated. Certain responses within email marketing software can automatically trigger reactions from your account, such as sending a preset "Welcome" email message to people sign up for your newsletter, making managing your email marketing software easy. It’s integrated with social networking. Because of the recent popularity of websites like Facebook and Twitter, you can integrate your email campaign with online social networks in order to set a wide net to capture more subscribers and potential clients. Learn more about what to look for in email marketing software in our Buyer's Guide. Read all of our email marketing reviews.